A few weeks back, I was nominated for four Liebster Awards all at once. I decided to tackle them two at a time, so that I could give them proper attention. This post is devoted to the Liebsters given to me by Lizzie at Yours, Mine and Ours and Jessica at The Wondering Brain. Thanks to both of these ladies for my Liebsters! I hope you'll pop in and check them out and maybe say hello. 1. My favorite Brat Pack movie is "Pretty In Pink." 2. My right foot is slightly larger than my left foot. 3. I have never eaten McDonald's Filet-O-Fish. 4. I have never purchased a lottery ticket. 5. I don't really like Facebook. 6. My favorite ice cream flavor is Haagen Dasz Dulce de Leche. 7. I greatly preferred Brandon over Dylan on "Beverly Hills, 90210." 8. I like babies but the baby stage was my least favorite with my own children. 9. I've watched "Grease" so many times I can recite all the dialogue along with the actors. 10. I have a strawberry birthmark on my scalp, underneath my hair. 11. I have mild scoliosis, which wasn't really a problem until I wanted an epidural. 1. What's the saddest movie you've ever seen? "Beaches." The first time I saw it, when I was about twelve, I cried for an hour after it was over. The ending just hit me very hard for some reason. 2. What's your dream car? I don't give a lot of thought to cars but I currently drive a Ford Escape SUV and I'm happy with it. I get good gas mileage, it's big without being a boat and we don't have a loan payment because we bought it with cash. 3. How many states have you lived in? Four. I was born in Georgia, moved to New York at five years old and grew up there, went to college in Massachusetts, lived in New York (a different region from where I grew up) after I was married and moved to New Mexico when I was 28; I have remained here for almost seven years. 4. What is your guilty pleasure food? Anything salty. I like potato chips (especially barbecue flavor), Fritos, Cheetos, dry-roasted peanuts, etc. 5. How long have you been blogging? I've been posting on my current blog since December 2012. It's not my first blog, though. I had a couple of others in the past but I was never committed to blogging regularly before I started my current one. 6. When you've had a bad day, what cheers you up? Working on something crafty, movies and indulgent snacks, jokes and laughter with my husband, hugs from my kids. 7. If all the fast food chains when out of business, which would you miss most? I think it would be a tie between Wendy's and Chik-Fil-A. I have a thing for chicken sandwiches. 8. Is anyone in your family in the military? My brother-in-law is in the Air Force. 9. What's the nicest compliment you've ever received? Overall, for my entire life? Probably that I am a good, devoted mother. But more shallowly, the fact that people have been pinning one of my afghans on Pinterest (which I'm not even a member of). It made me feel really good when I realized it was happening. 10. Pedicure or manicure? People will probably think I'm nuts, but...neither one. I have only had one manicure and it was to have acrylic nails put on for my wedding. I hated wearing them and had them removed three days later. I have never had a pedicure at all. 11. Have you ever had a paranormal experience? Not that I know of. 1. What made you interested in blogging? I have been an avid reader of blogs for years and recently got very hooked on certain crafting-related ones which led to reading more and more of them with regularity and eventually I decided that maybe I could join the ranks and share some bits and pieces of my own life. 2. Who is your hero? Why? My son is my hero. He has faced some big challenges in his short life, mostly pertaining to his health (he has some congenital health problems which are ongoing today). But he is brave and never feels sorry for himself. We could probably all take a lesson from him. 3. If money was no object, what would you spend it on? To be very honest, I probably wouldn't spend it. Not much of it, anyway. I am a very frugal person, cheap even. I would make some minor upgrades to my home and then I'd save or invest the rest. 4. Do you sing or dance? I love to sing. I was always in choirs and choruses when I was in school. I sing daily at home, just because I enjoy it. I almost always sing along with the radio when I'm driving. I wish I could dance but I never really learned. 5. What is your favorite childhood memory? My father would take us on short hikes in an open field area near our house. We would bring our dog and let him run around off the leash. Sometimes we would bring a little picnic, like cheese and fruit. I always enjoyed these times with my dad. 6. What is your dream vacation? I would visit Europe, spending weeks there, going to many countries and really trying to live like a local. Lots of hiking, staying in hostels or camping, shopping for provisions, just trying to do what the local people do. 7. What is the most daring thing that you've done? I moved to my current state without ever visiting it first. My husband was offered an excellent job here and he's from this part of the country, so I trusted him and took a leap of faith. We sold our house, packed up our belongings and our then-one-year-old son and never looked back. I love my adopted home. 8. What is your favorite book? A Tree Grows in Brooklyn by Betty Smith. My aunt gave me a copy of this book when I was ten years old and I fell in love. I have read it at least twenty times. I used to finish reading it, flip it over and start it again. It has been two years since I last read it and I think I might be due soon. 10. What do you plan to achieve this year? I'm working on being more patient, more active and more discriminating in certain ways. 11. Where do you see yourself in 5 years? Right here. My life is under this roof with these people. I was born to be a wife, mother and homemaker and I have never felt more at ease in any role than I do in this one. 1. Do you like theme parks? Which is your favorite? 2. Do you like to craft? Which crafts do you do? 6. What is your favorite thing to find in your mailbox? 7. Chocolate with or without nuts? 8. Do you color your hair? 9. Have you ever had a speeding ticket? 10. What is your favorite place to buy clothes or accessories for yourself? 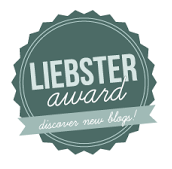 I would like to pass the Liebster Award on to the following blogs. All of them are interesting and I recommend taking a look and maybe saying hello. I want to preface the list with this, however: it has come to my attention that some people may find these awards to be kind of spammy. Please know that I totally understand if you don't want to participate and I apologize in advance if anyone finds the nomination annoying. I think Liebsters are all in good fun and I just want to offer others the chance to join in if they want to do so. If you've made it this far, thanks for reading my latest Liebster post! These have been really fun to do and I feel honored to have been chosen. Thank you again to all of the bloggers who nominated me for Liebster Awards. Congrats on your award and I enjoyed reading your lists! Just got home from the ER with hubby.. he cut both hands.. long story.. I share these random facts of yours. I loved Pretty in Pink, I had a bit if a thing for Brandon, I found the baby stage v hard and yet I love babies and Grease Is The Word!!!! Congratulations on another award! It's always nice to find out a little more about blogging friends and what makes them tick. I've never had a pedicure either. And I don't think I've had a manicure since the kids were born and I probably could really do with one! Hi, I nominated your blog for the Very Inspiring Blogger Award. Visit Cuddlesandbubbles.blogspot.com for more information about it. PS.....I love your afghan too!! I love reading the answers to these questions. So nice to learn more about my favorite bloggers. Beaches is a terribly sad movie. I watched it once cried for a long time and will not ever watch it again! I love pedicures. I don't get them often because of the price but I love to when I can. Your dream vacation matches mine. I would love to go live in Eurpoe for a few years but my husband does not share this desire at all. He will never move from the U.S.
Congrats on the award :) I agree with you on Pretty in Pink and Brandon over Dylan on 90210. I found Dylan very annoying!